On paper the Xperia Play seems like a good idea. An Android phone with a slide out gaming pad. Then it was released and everyone yawned. Today's OnLive announcement could turn those yawns into Woohoos. 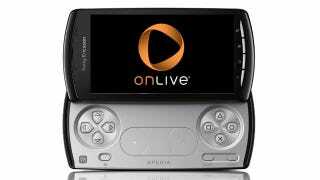 From the moment we launched our OnLive Android app, gamers began asking about Sony Ericsson Xperia PLAY game control support. We listened and delivered. Now Xperia PLAY gamers in the US and UK can play almost all of OnLive's 200 premium titles-including hit AAA games like Saints Row: The Third and Assassin's Creed: Revelations-on their Xperia PLAY smartphone with a full console-class experience, including multiplayer and social features.